It is tradition that on even-numbered years I use a non-traditional color scheme in the Dining Room for Christmas. In 2014, I decided to use turquoise blue and pair it with some gorgeous peacock canapé plates I found at Pier 1 for my theme. It was stunning! Of course, the Christmas theme always spills into New Year’s Day (and often beyond! ), and I hosted a New Year’s Day dinner to ring in 2015. I did not use a tablecloth that year, as I felt that the turquoise tablecloth I had was too bright, and white was too stark and cold. I used my antique Nippon plates for the main course (thrift store), and Gibson’s Studio Gold bowls for soup and salad plates for the liner (Bed, Bath and Beyond). Royal Golden Plume flatware was a perfect match (antiques store in Butte, MT), and my cute peacock canapé plates served as bread and butter plates. Longchamp by Cris d’Arques held water, gorgeous iridescent teal wine glasses held white wine (Pier 1), and champagne was served in elegant lead crystal flutes of unknown manufacture (thrift store). 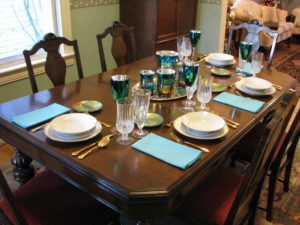 I used turquoise napkins found at Herberger’s years ago, and they worked fabulously. The centerpiece was a silver plated oval platter by Leonard (thrift store) with a candle set I purchased at Michael’s in Great Falls that had a peacock tail themed pattern. I also found glass decorator stones to compliment the candle set at Michael’s, and scattered them on the silver plated platter. Flanking the platter are a set of antique silver plated peacock salt and pepper shakers, which are among my favorites of all time (antiques shop in Chinook, Montana). This was a lovely theme and I really hated putting this one away! New Year’s Day Dinner 2015, using the Peacock Christmas theme.